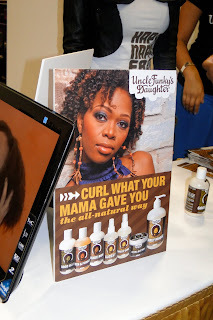 It may take a few weeks but I am going to start cranking out posts about my experience at the World Natural Hair show in Atlanta. Usually when I go to events like this, I have to take someone with me to help me out. As a blogger, I have to not only secure interviews, but receive/pass out business cards, take pictures, tweet, record videos and chit chat with whoever I come across. It's a hard job so I am always grateful when I can force get a friend or family member in that city to help me out. On to the coverage we go...one of the largest vendors at this year's show was Uncle Funky's Daughter. Now why haven't I heard of them before? Have y'all? On the first day of their show, their booth was d-ed up. Which is slang for "crowded". I was bumpin' fro's and locs just to make my way over. This Houston, Texas based salon and boutique was quite the crowd please-r. And rightfully so. They had great t-shirts!! Of course I had to snag one. The show price for the tees was $20 but I sho would have purchased it for $5 more had I seen it online first. Not pictured is the "Perms are Evil" shirt. Talk about making a statement! Would you wear that shirt? But you know...most, if not all of the ladies at the booth had curly hair. I didn't see anyone with 4a or 4b-type hair. When you go to their website, you'll notice a beautiful banner of lovely ladies with natural hair. But most have curly 3a hair. Which, I think, discourages the naturals with thicker hair. But that's another rant for another post. Good news is, most of the products are silicone and paraben-free. Check out Uncle Funky's Daughter here. Hi, I visit your blog often, although I do not have loc's I am AuNatural. And your blog along with your hair is...beautiful. Uncle funkys daughter.. 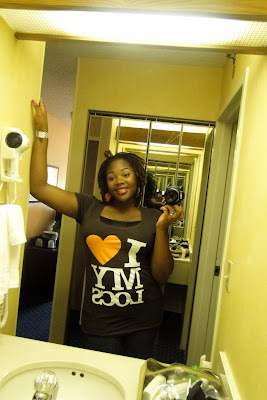 I looove their curly magic which is all I use in the way of a curl enhancement product. So, glad you had a good time at the hair show. I thought I was the only one - not knowing about their products - I learned about them a few months ago. I think I will try them to see how they work on '4' hair. I've never heard of Uncle Funky's Daughter. Their products are kinda expensive. I'm always willing to try new stuff though. Did you sample any? Um, one thing I hate is that so many natural curl products make people's hair look like they used an 80s Jheri curl or texturizer. I'm not sure if that is what the product actually does but many of these products feature promo photos that do that. It almost reminds me of the uniformity of the before and after relaxer pics. Just saying. I'm mad late posting on this...but I go to Uncle Funkys Daughter to get my loc maintenance. I love their products and their service is second to none. If you are ever in the Houston, Texas area I suggest you stop by Rice Village for some shopping at Uncle Funkys Daughter and Funky Couture their boutique. I heard about this place the first time I bc'd, but I'm ashamed to say I haven't been to the salon and I lived in Houston up until last year. I've heard mixed reviews on the place, but I do love their shirts and yes I would totally rock the perms are evil shirt.